Miami is a favorite spot for vacationers and businessmen alike. Every winter the city attracts hundreds of thousands of people from around the world. Despite the huge influx of international visitors, Miami remains a favorite spot for millions of Americans too. Californians, and more specifically Los Angelenos, love Miami! If you are leaving the City of Angels to settle in Miami, whether long or short term, and taking your car with you, have you thought of how to actually transport it? Given the distance between the two cities, it is not something that can happen overnight. Good planning is key. To come up with a good plan, you’ll need to investigate and explore your options. Review our guide so you can make an educated choice and learn the answers to the most common questions. Why should I hire a car shipping company? How does auto transport generally work? How much does it cost to ship a car from Los Angeles to Miami? Why should I hire a professional car shipping company? The distance between Los Angeles and Miami is 2730 miles. Non-stop drive would roughly take you 37 hours 57 minutes to cross the country without stopping. And realistically speaking you are not going to want to drive without stops, especially if you are the main driver. To traverse the distance between the two cities, you’ll need to plan ahead. You’ll have to make sure your car is ready for a cross-country road trip and you, as a driver, have enough stamina to endure an extended haul. You can opt for services of drive-away companies, whose primary purpose is to match cars with drivers. Potential drivers have to comply with age requirements and have clean driving record. And although the companies follow strict criteria when matching drivers with vehicles, your car will still be driven by someone you don’t know. Why not hire a professional auto transport company? That way you won’t have to worry about being in the best shape to handle an untimely cross-country road trip, the wear and tear of your vehicle, or someone you don’t know driving your car. You won’t have to plan almost a week-long road trip either. And you can use the time you would otherwise spend driving to tend to other important tasks, or just enjoy your family and friends. Hiring a professional auto transport company will also be your best option when you have more than one vehicle or your car doesn’t run under its own power. Just keep in mind that in the auto transport business, some shippers are more reputable than others, so it’s extremely important you choose carefully. You can always check online reviews, but take them with a pinch of salt. Don’t forget to consult the FMSCA for companies’ licensing and background info and safety record. And, of course, employ your intuition. Pick up the phone and call, ask questions. The good company will be transparent about the entire process. They understand that auto transport is a business built on trust and will do their best to win yours over. In the US, most auto transport carriers are independent owner-operators who work with auto transport broker companies daily. Carriers work closely with brokers to service private and business clients. Most management/brokerage companies are carriers as well, but in general to be a good broker you have to learn how to manage the demand and supply fluctuations in order to offer fair market prices to both the customers and the carriers. Thanks to the collaboration between brokers and carriers the auto transport industry functions and stays competitive, keeping at bay monopolization appetites of big companies. It is an efficient system that makes the industry run smoothly because one carrier company cannot service the entire country, which makes the broker management companies an indispensable alloy. Request a quote online or by phone. We will ask you to share details about your vehicle such as make, model, modifications, vehicle condition as well. You will also have to specify pick up and drop off destinations and your first available date. Then you will need to select between open and enclosed auto transport. Don’t worry if you are not sure which option to choose. Check out our infographic or call us and let one of our logistics experts explain the difference to you. Once we agree on all the details, we will contact our carriers and schedule your shipment. When we assign a carrier, you will receive an e-mail with dispatch notification confirmation with an estimated pick up date and your assigned truck driver’s phone number. Usually, the carrier picks up your vehicle one to five business days from your first available date. Note: An exact pick-up date is not guaranteed. Auto transport carriers do require a window of 1 to five days to pick-up a vehicle. In the auto transport industry, many factors can delay trucks on the road, such as late customers, traffic, bad weather and sometimes truck failures. Cars are transported with big trucks that haul anywhere from seven to ten vehicles, and they all go to different customers which means that the carrier makes multiple stops in different locations to drop-off and pick up vehicles. Make sure your car is ready for shipping. Give it a good wash and make sure there are no leaks or mechanical issues. At pick-up, the driver completes an inspection report before loading. We encourage you to take detailed photos of your car before loading. In a very unlikely case of damages, they serve as proof of your vehicle’s pre-loading condition. 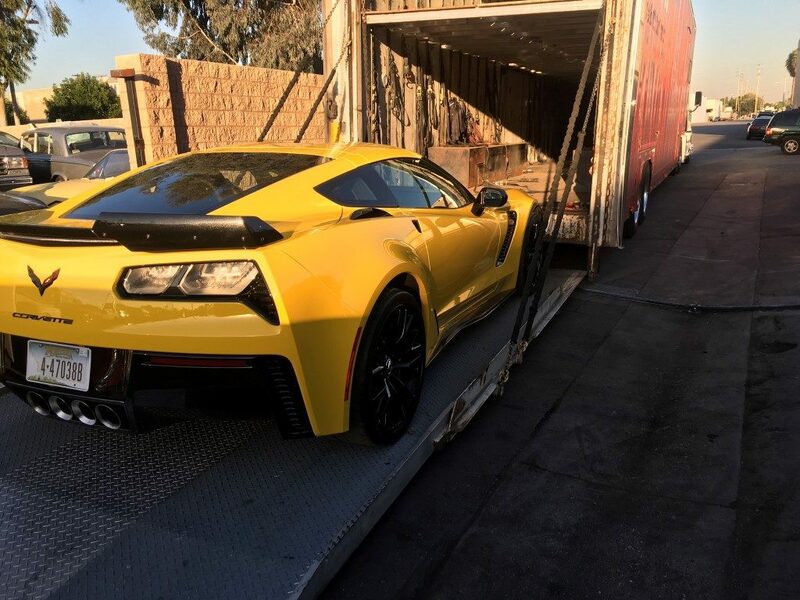 Auto transport Los Angeles to Florida takes about 7 to 10 days, but in the logistics industry delays do happen due to circumstances out of carrier’s control so you should be patient and keep in touch with your carrier. At delivery, the carrier inspects the vehicle again and unloads it as close to your door as possible. How much does it cost to ship a vehicle from LA to Miami? The cost to ship your vehicles depends on the make and model, modifications, running condition, whether you choose open or enclosed auto transport, as well as exact pick up and delivery locations. Seasonality, or supply and demand, also affects the auto transport prices.Higher demand usually means more expensive service. On most routes, the demand can peak at any time, and daily tracking of such fluctuation is essential for accurate pricing and timely shipping. Carriers prefer loads that pay a realistic market price. Anything lower than the current market rate means that you will have to wait longer for a carrier to agree to pick-up your vehicle. On the other hand, when the demand is low customers usually benefit from lower prices. Request multiple car shipping quotes to get the ballpark figure for the cost of transport. Rates will vary between the companies, that’s why it’s important to get an idea of an average cost to ship a vehicle. We transport cars from Los Angeles to Miami on a regular basis! It’s a popular shipping route not only for those who are moving but for snowbirds and vacationers alike. Our company has dedicated drivers to cover all Florida routes, weekly. When you call, we will explain the shipping process and recommend the right service. Besides moving automobiles, we have shipped motorcycles and boats. When you contact us, our logistics experts will answer all of your auto transport questions and walk you through each step of the shipping process. If you have recently purchased a vehicle or a motorcycle online, from eBay or a dealer, and need auto transport to Florida, we can help you transport it safely. Our agents work hard every day to guarantee timely pick-up and delivery, as well as professional services. To provide you with the most accurate price we manually track daily demand and supply fluctuations on the national dispatch boards. We do not use car shipping price calculator because automated quotes do not reflect the most current market conditions. Some major factors that affect car shipping prices change daily, making it practically impossible for preset software to produce an accurate estimate. Why Miami could be a better choice than Los Angeles? At first, you would not think that those living in Los Angeles would want to relocate or vacation in Miami, but it is a verifiable fact that many do. Miami is different than Los Angeles in many aspects. We can even go ahead and give you a few reasons why many Angelenos choose to call Miami home. The fact is that Florida has no personal income tax and Miami sales tax is only 7 percent. California has one of the highest income taxes in the country, and the sales tax in L.A is 9 percent. Additionally, when it comes to doing business in both states, Florida wins. Rents in Miami are high but compared to those in Los Angeles we know you will choose Miami. The rent to salary ratio in Miami vs. that in LA will definitely make a difference when it comes to lifestyle. The air pollution is worse in L.A. If you have ever been to Miami, then you know that the air pollution in Los Angeles is way worse. In fact, the top five most polluted cities, in certain categories, are in California, and LA ranks number one in ozone air pollution. LA is notorious for its traffic. And although study after study proved Miami traffic is bad, nothing beats LA – city with the worst traffic in the entire country. Well, at least until Mr.Musk builds his tunnels. Many people say that they prefer a hurricane over an earthquake. Some may wonder at that. But at least hurricanes are predictable while earthquakes just happen without warning. Big hurricanes tend to affect South Florida coast more often than major earthquakes hit LA. Although small quakes in L.A. happen so often that there is an automated Twitter feed dedicated to tracking them. Now, after this information, one would think twice before deciding where to move. Or maybe not. Maybe you have made up your mind already and moving Miami. If this is the case, then congratulations. If you need to ship your vehicle from Los Angeles to Miami, request a quote online or call us now. Corsia Logistics team is here to help! We will explain how the auto transport process works so you can have a peace of mind, and we will schedule your shipment based on your preferences. For more information, please visit our How It Works section or call us. Thank you.